Groz-Beckert, a leading provider of industrial machine needles, will demonstrate the company’s innovative litespeed plus needles in action at the upcoming ITMA Asia + CITME 2018, the leading trade fair for textile machinery that takes place in Shanghai, this month. Visitors will have an opportunity to experience the interplay between the system parts and needles in the flat knitting machine, which makes even the most challenging patterns possible thanks to the precise transfer, and follow the process of creating a warp-knitted fabric and the loop formation with extremely fine gauges on the sock machine. A further highlight presented by the product group Circular Knitting is the chrome-plated needle. Thanks to its chrome-plated hook, the lifetime of the needle can be significantly increased, for example, when using abrasive yarns. In the product group Legwear, the focus is on the variety of our ever-growing range of needles and matching system parts. 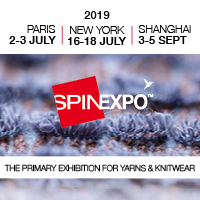 “The precise interplay between the individual components is presented vividly at our booth by the example of different knitting types,” the company adds. The manufacture of compound needles also requires maximum precision, as the needle and closer part must mesh precisely, yet must be able to move independently of each other. In the Flat Knitting sector, these needles are used to achieve finer gauges and to produce fully fashioned articles and complete items. “Our warp knitting customers are also aware that not all needles are the same. Loose, as well as in modules – original Groz-Beckert needles and system parts are in a class of their own on the market. They form the basis for long lifetimes and a uniform loop structure,” the company says. Groz-Beckert is a leading provider of industrial machine needles, precision parts and fine tools, as well as systems and services for the production and joining of textile fabrics. The products and services support the fields of knitting, weaving, felting, tufting, carding and sewing. Groz-Beckert operates with agencies, production and distribution subsidiaries in more than 150 countries around the world.